Victorinox has introduced new pocket knife USB 3.0 flash drives, available in 64GB, 128GB, 256GB and even 1TB capacities! The flash drive promises read speeds of up to 220MB/s and write speeds of up to 150MB/s, as well as 256-bit hardware and software-based encryption. Interestingly, the flash stick can be detached from the knife to enable you to get past airport security. Also new in Victorinox's lineup is the Slim 3.0 USB Drive, which promises to be ten times faster than its USB 2.0 predecessor. Today at the 2012 International Consumer Electronics Show, iconic brand Victorinox Swiss Army (VSA), the exclusive marketer of Victorinox USB Flash Memory devices, announced the launch of two new portable storage additions—the Victorinox SSD and Victorinox Slim 3.0. VSA brings more than 125 years of trusted precision, quality, function and versatility to its newest consumer electronics innovations, which is a burgeoning product category for the brand. The Victorinox SSD (Solid State Drive) and Victorinox Slim 3.0 USBs offer unprecedented data storage capacity with security measures fit for protecting the most confidential of personal and professional documents. Each pocket-sized device packs anywhere from 16GB to one terabyte of storage capacity, is equipped to withstand a range of environmental and daily use factors, and remains true to the Swiss Army legacy of flawlessly designed products that endure. 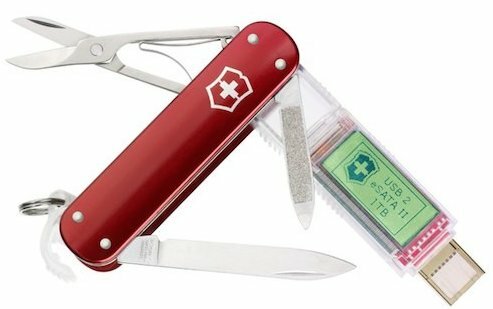 "The Victorinox Swiss Army brand is synonymous with everyday "survival" tools and we continue to evolve our product offerings in the electronics division to provide solutions for living in a technology-focused world," said Andrea Huder, Head of Electronics for Victorinox. "The addition of the Victorinox SSD and Slim 3.0 to the flash USB line provides consumers with a quick and reliable way to store, transport and protect their personal and professional documents." VSA will be exhibiting at booth #36218, located in the South Hall of the Las Vegas Convention Center. CES attendees are encouraged to stop by to learn more about new and existing Victorinox Flash USB Memory devices, view interactive demonstrations—including our "Beat the SSD" challenge, and meet personally with Swiss Management and Victorinox Swiss Army founding family members.